Many factors have contributed to the destruction of soil fertility, starting with biodiversity loss which is the root cause of the decline of wildlife, habitat and croplands. 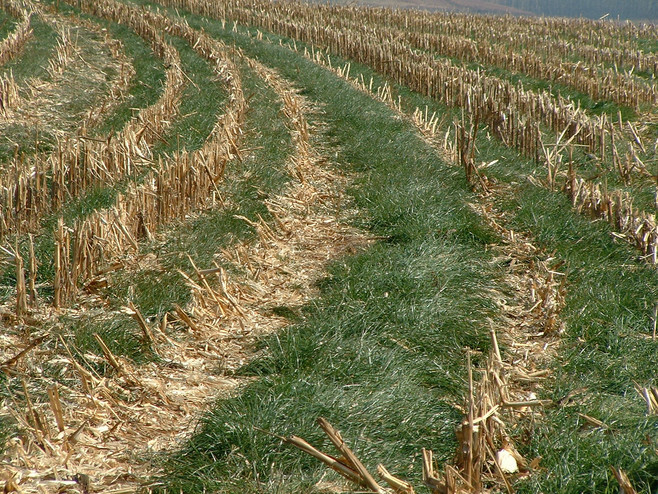 Farming, ranching and wildlife practices are best judged according to the extent to which they restore soil fertility. Most everything we do fails this test. Four generations of Jonathan Cobb’s family tended the same farm in Rogers, Texas, growing row upon row of corn and cotton on 3,000 acres. But by 2011, Cobb wasn’t feeling nostalgic. 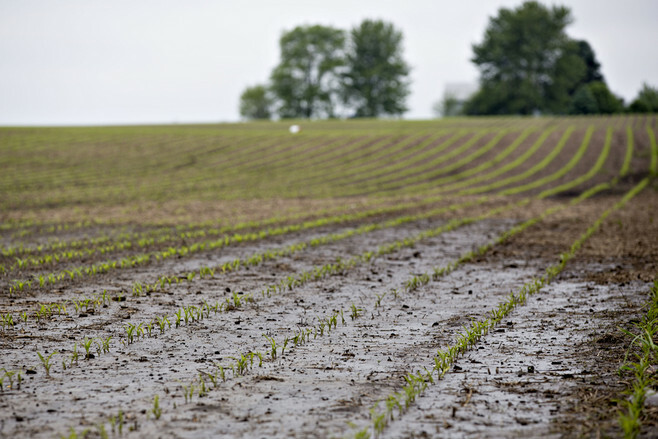 Farming was becoming rote and joyless; the main change from one year to the next was intensively planting more and more acres of corn and soy, churning up the soil and using ever more chemical fertilizers and herbicides to try and turn a profit. A clump of soil from a heavily tilled and cropped field was dropped into a wire mesh basket at the top of a glass cylinder filled with water. At the same time, a clump of soil from a pasture that grew a variety of plants and grasses and hadn’t been disturbed for years was dropped into another wire mesh basket in an identical glass cylinder. 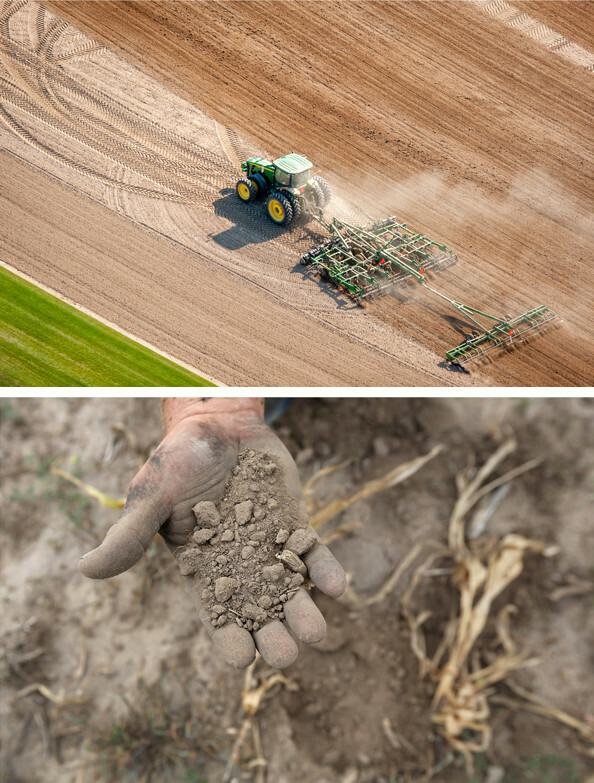 The tilled soil–similar to the dry, brown soil on Cobb’s farm—dissolved in water like dust. The soil from the pasture stayed together in a clump, keeping its structure and soaking up the water like a sponge. Cobb realized he wasn’t just seeing an agricultural scientist show off a chunk of soil: He was seeing a potential new philosophy of farming. The shift he’s talking about is a new trend in agriculture, one with implications from farm productivity to the environment to human health. For generations, soil has been treated almost as a backdrop — not much more than a medium for holding plants while fertilizer and herbicides help them grow. The result, over the years, has been poorer and drier topsoil that doesn’t hold on to nutrients or water. The impact of this degradation isn’t just on farmers, but extends to Americans’ health. Dust blowing off degraded fields leads to respiratory illness in rural areas; thousands of people are exposed to drinking water with levels of pesticides at levels that the Environmental Protection Agency has deemed to be of concern. The drinking water of more than 210 million Americans is polluted with nitrate, a key fertilizer chemical that has been linked to developmental problems in children and poses cancer risks in adults. And thanks to some modern farming techniques, soil degradation is releasing carbon—which becomes carbon dioxide, a potent greenhouse gas—instead of holding on to it. In fact, the United Nations considers soil degradation one of the central threats to human health in the coming decades for those very reasons. This comes from someone who has done nothing agriculturally other than have a small backyard garden. We buy as much organically grown fruits and vegetables plus meat from farms which do not use harmones and are totally grass fed that we can. i.e…the Whole Foods Market has stopped carrying organically grown peanuts and I have not and will not purchase peanuts until they bring them back. We drive to the west coast from Nashville, TN. each year and the leaving and arriving near Amarillo, TX. Is damn near disgusting from the odor of the holding pens. Can’t see how having the animals standing near knee deep in their own urine and feces is good for them or for humans. I found the article informative. I have been reading about the ranch for a few months now and find it informative. While I have spent only a small time on vegetable and fruit farms both sides of my mothers families came here to the USA in 1854 from Germany. Some settled in Missouri and some in Southern Indiana. My fraternal grandfather was the first organic farmer I ever met. He came here from Italy in the late 19th century. That part of my history may be what causes my interest in your articles. Anyway keep up the good work. There are so many problems with the feedlots. Environmental damage, cruelty, antibiotics and hormones fed to cattle that remain in our beef, economic damage to ranching. We should all support the organic producers and I commend you for doing so. Sorry i just stumbled across this page today – well now I can enjoy some good reading and catch up on what you have been up to. Today is the anniversary of the burros final leg of their epic road trip to you on Todd’s truck. also i wanted to pass some unrelated information on. I saw your article on soil health and wanted to suggest you google White oak Pastures here in Georgia. Watch the short documentary video of Will Harris and his venture….called A Thousand Beating Hearts. I think you would like his thinking. We have raised a few foals, they are the most interesting animals on the ranch in my opinion.